Lawn Bags (yard) signs - are the best solution for promoting your business, service, political campaigns, fundraiser or an event. Why lawn signs are good for business? 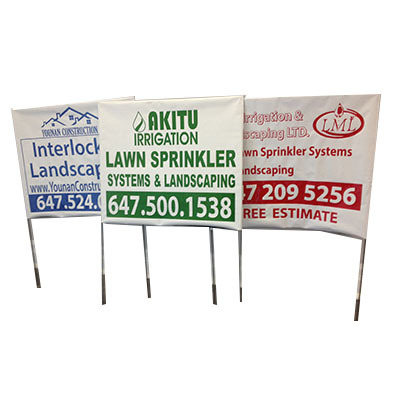 Lawn signs are still one of the most affordable ways to advertise your business or event. You can raise your brand awareness and presence in your local area. Your sign on your customer's property is almost as good as a word of mouth advertising. You get the best ROI from yard signs without spending a fortune. Bag signs are the cheapest option. We offer packages of 100, 200 and 500 signs. Coroplast signs are more reusable and durable option. Full color signs are very affordable in small quantities of 5 and up. Car magnets will take your advertising with you wherever you go. Banners are best used to promote your events or specials, or just to make it easier for your customers to find you.